Using a deep cycle RV battery over a standard car battery will ensure you are able to power all your RV accessories such as lights, heaters and more. Using a battery that is unable to hold enough charge to power your appliances can be very frustrating. The best RV battery is the Optima Batteries BlueTop, which is both a starting and deep cycle battery that boasts a high reserve capacity and fast recharging. When travelling around in your RV, you will not always have the option of using a 110 volt power supply. This is where a RV deep cycle battery comes in useful as you can drive to the middle of nowhere and still have power to use all of your appliances. A deep cycle RV battery is one of the most important components of your RV and without it, you will struggle to power up your appliances. Many RV owners may even choose to install multiple batteries to reflect their high energy consumption with devices such as a RV air conditioner that are used on most RVs. Budget plays a big part in many peoples buying decision but the majority are reasonably priced but we have listed premium and affordable options. Most batteries will last many years and its highly advised to invest in one with high ratings, even if its above your budget. Below is a list of the best RV batteries that will power all your electrical appliances with a high reserve capacity. Optima is one of the most respected brands in the world of vehicle batteries, and their BlueTop model are some of the best for RVs. With such long-lasting power and durability, you are guaranteed to get your money’s worth from these batteries. They are even used as a marine battery for boats, which is a further testament to the build quality of this RV Battery. Overall, the Optima BlueTop is the best RV battery you can buy and although slightly expensive, it is definitely a worthwhile investment. VMAX is a brand that are very reputable with their batteries in the automotive, marine and RV industry. This RV battery is very effective for use with solar panels or other natural forms of energy and has a extremely heavy duty construction. Here are some of the notable features of the Vmaxtanks Vmaxslr125 battery. The VMAX RV Battery is very efficient and is able to hold charge for a long time with low-maintenance. Overall, it is best RV deep cycle battery being a Group 31 battery with 12 Volts and 125Ah capacity. The Odyssey PC680 battery is a bestseller and another top choice for RV batteries. This battery is extremely durable and is designed specifically to stand up to the impact of being on the road in an RV. The design is space-efficient to provide more power in the same amount of space as other batteries. This battery provides twice the power and three times the life span of a traditional battery, so you get great value for money. The superior quality of this battery makes it a standout purchase for any RV owner looking for an affordable option. If you use solar energy combined with the battery on your RV, the Renogy Deep Cycle AGM battery is a good option for you. This battery is specifically designed for solar energy storage, so you’ll get the most efficient energy from your solar panels. Overall, it is the best RV battery for solar battery chargers and they work very efficiently to keep everything in your RV running smoothly. Renogy also offers this RV battery as a 6V 260Ah, 12V 100Ah and 12V 200Ah. This is another battery is that is made by the Vmax brand and is a small deep cycle battery that works well for a variety of different types of RVs. It is also one of the most affordable RV batteries available, so it is a good choice for anyone on a budget. If you are looking for a cheap RV battery that still provides great quality, this is one that is developed by one of the best brands on the market. Although it is not the largest or most powerful battery, it still works very well and is easy to install. Vmax is a great brand that makes very durable products that will last for many years to come. Buying a battery for your RV can be very overwhelming, particularly if you don’t have much experience in the area. There are many technical specs to look at that can be confusing at first. However, once you determine what each spec represents and why it is important, choosing the best RV battery for your needs becomes much easier. RV batteries are a bit more complicated than normal car batteries. Any vehicle needs a battery to store energy and power all of the functions of the car that aren’t powered by gasoline. In an RV, you have many more features that aren’t powered by gasoline than in a typical car. You’ll need to worry about powering things like lights, power strips, refrigerators, heaters, and other electronics. Therefore, RV batteries are much more complex, and you’ll need to purchase a battery that can adequately support your vehicle’s needs. Here are the factors to consider when shopping for an RV battery. When looking at these things, you’ll need to think about how they would work with your specific vehicle, instead of just how they compare to other batteries. One of the first things to look at when buying a battery for your RV is the size. Batteries come in many different sizes and shapes, and each RV model has a specific battery size it can accommodate. Before going shopping, you will need to look up what size battery your vehicle needs. Many Amazon pages and other places where you might buy an RV battery actually have functions that can help you determine what size battery would be best for your RV. Check this before making any purchases so you can avoid dealing with frustrating returns processes. You should also check to make sure that the battery is universal and will work with any model of RV. Most batteries are universal, but some are specific to certain types of RV makers. When choosing an RV battery, you should always go for a ‘deep cycle‘ battery. This is because RVs require so much more power than a normal car (or many other types of vehicles, for that matter). 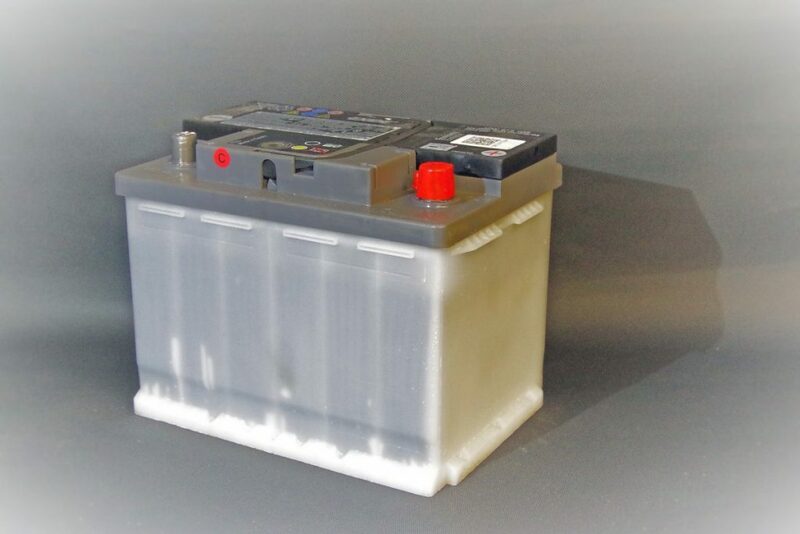 Deep cycle batteries are much more powerful, with better, more efficient energy storage. This means they can more effectively power large vehicles with several different types of technologies inside. Another factor to consider when purchasing an RV battery is the ease of installation, particularly if you are installing a battery for the first time. Many RV batteries are designed specifically to work almost right out of the box, with very simple startup instructions. Others are much more complicated and require more technical knowledge. If you are unsure of how much work will go into installing the battery, try looking up the instruction manual for that specific model online. This will give you a better idea of what you need to do to get the battery installed. The specific power level of your battery, measured in amperes, is another factor to keep an eye out for. The more amperes your battery has, the more powerful it is going to be. Your RV model likely has a base number of amperes it needs to start, and then you may need more depending on the types of appliances and add-ons you have inside. Determining how many amperes of power you need will make it easier to shop for a good battery for your RV. Batteries go bad after a certain period of time, so it’s important to make sure that you purchase a battery that will still be good by the time it arrives at your house. You can determine the life span of a battery by looking at the manufacturing date. 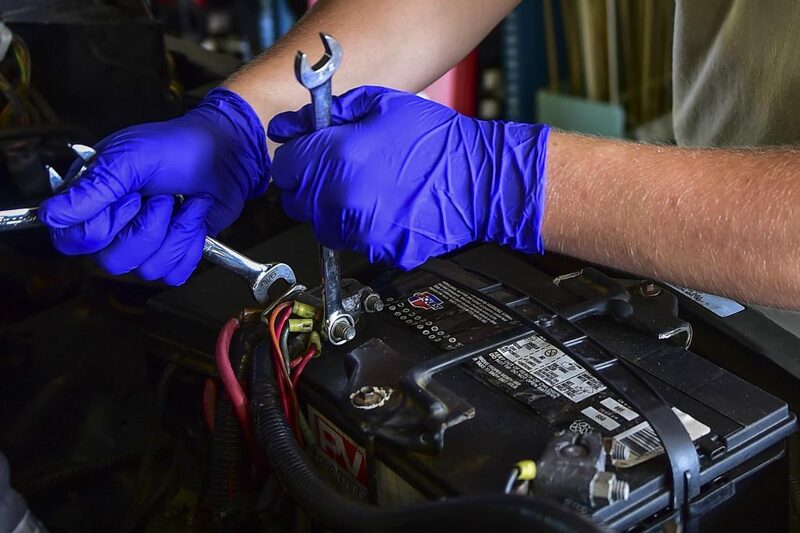 Every type of battery is slightly different, so it’s important to double check with the specific battery brand how long their batteries last for. If you buy an expired battery, it likely won’t be able to hold a charge, making it virtually useless. You’ll want to get the best bang for your buck when purchasing an RV battery, and one factor to look at is how long the battery will last. RV batteries have varying life spans, usually lasting several years. Determining how long the battery will last can help you decide whether or not it is a good buy. You should also determine how long it will last in between charges. The less often you charge your batteries, the more convenience and use you’ll get out of your RV. Batteries are rechargeable, and you will need to stop to recharge your RV every once in a while to keep your appliances working. Many RV owners install solar panels to make the process of recharging easier and more convenient, although this is not necessary. When purchasing a battery, you will want to look and see how long it takes to recharge. Most RV batteries take several hours to recharge, but some take much longer than others. This can be very frustrating for those who live mostly out of their RVs, because a charging battery means you can’t use your lights or appliances. When you are on the road, your RV battery is going to experience plenty of vibration and movement. This means your battery needs to be very durable and resistant to impact. Good RV batteries are specifically designed to be vibration and impact resistant. This is something to look out for when purchasing a battery. Take a look at the materials and the way the inside of the battery is constructed to get an idea of how it will hold up under pressure. The weight of the battery is another factor to consider when it comes to installation. A heavier battery can be quite difficult to install, particularly if you don’t have much upper body strength. However, larger, heavier batteries often provide more power, so it’s a tradeoff of which is most important to you. Heavier batteries can also be more difficult and expensive to ship, so this is something else to keep in mind. Many RV batteries come with a helpful warranty policy. This provides peace of mind, because you’ll know that you can return the battery if it doesn’t work with your RV or develops an issue. Some RV batteries also offer maintenance help for a certain period of time after the battery is purchased, which is very helpful. RV batteries should be changed periodically to ensure safety and quality functioning of your vehicle. When buying a new battery, finding the best value is paramount, because a high-quality battery will help you really get the most out of your RV. A good RV battery should be durable enough to withstand natural wear and tear, and it should also run very efficiently. There are many batteries that fit this description, and the five that stand out the most have been covered here.